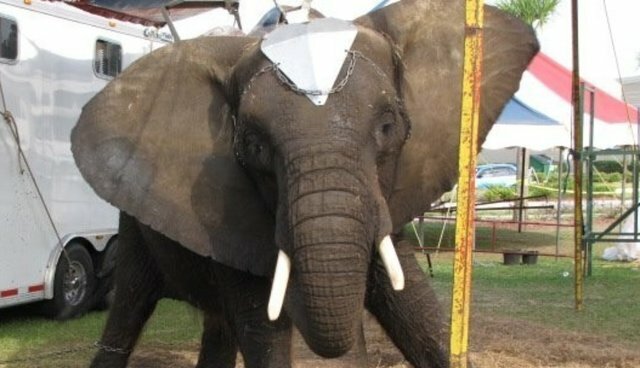 Nosey, an elephant captured from Zimbabwe after her parents were killed, has spent the last two decades at the Liebel Family Circus in Florida -- and along the way, become a potent symbol for animal activists insisting she be freed from what they call inhumane conditions and mistreatment. Nosey's moment of truth may have come. On Monday, PETA filed a complaint with the Fish & Wildlife Conservation Commission of Florida, asking the office to not renew the captive wildlife permits of Nosey's handler, Hugo "Tommy" Liebel. In the complaint, PETA cites the FWC rule, which states that "[n]o person shall maintain captive wildlife in any unsafe or unsanitary condition, or in a manner which results in threats to the public safety, or the maltreatment or neglect of such wildlife." Nosey, PETA alleges, has lived for years with an untreated skin condition, and has been chained in too-tight quarters. Liebel also employs a controversial tool called a bullhook (Los Angeles banned the use of bullhooks on circus elephants last year) to coerce the 30-year-old animal. The complaint also notes that Liebel, who also owns and exhibits a spider monkey named Reggie, has received almost 200 citations from the U.S. Department of Agriculture for violations of the Animal Welfare Act since 1993. It also alleges that Nosey poses a public safety threat, having once attacked a handler and sent him to the hospital. Liebel charges people to ride Nosey on his own and also at circuses, like Shrine Circus and UniverSoul circus, which New York recently banned from performing in part over concern for the way its animals, elephants in particular, were treated. Animal advocates have long decried Nosey's conditions and said that she should be released to one of the two U.S. sanctuaries, where she could be among other elephants. "Nosey has been by herself more than decade," said Delcianna Winders Deputy General Counsel of Captive Animal Law Enforcement for PETA. "As social animals, elephants are meant to be with others -- especially females." In a statement submitted alongside PETA's complaint, Philip Ensley, a former San Diego Zoo veterinarian who has studied photos and video footage of Nosey, says, "the female African elephant known as Nosey has undergone long term suffering and abuse and should be surrendered immediately, and without delay. This is the worst, most prolonged, documented example of an uncorrected case of suffering and abuse in an elephant I have ever reviewed." Liebel has been contacted for comment; we will update this post when we hear back. When he took Nosey to a fair last summer in Minnesota -- and PETA raised concerns -- he told a local reporter: "I have legal certificates, I've had federal inspections, all good." You can sign a petition calling for Nosey to be freed here.